Earlier this week, social media users were captivated by a raccoon's amazing ascent up the 23-story UBS Plaza building in St. Paul, Minnesota, who was dubbed #MPRRaccoon by Minnesota Public Radio (MPR) reporters who had been following the story. Among them, apparently, was none other than Dwayne "The Rock" Johnson, who used his considerable social media savvy to create a rather hilarious "cross-promotional" poster for his upcoming movie Skyscraper, hitting theaters on July 13. The poster is essentially the same as the previously-released one-sheet, but The Rock just happened to add a raccoon on his back, as he dangles from the edge of the Skyscraper. Here's what Johnson had to say in his Instagram post. The amazing saga of the MPR Raccoon began on Monday, when construction workers noticed the raccoon just a few stories up on the nearby Towne Square building. The next day, maintenance workers tried to get it to come down, but instead, the raccoon started scaling the side of the UBS Plaza building. Throughout the day, workers in the UBS Plaza building started sharing their photos of the raccoon, either while the raccoon was in mid-ascent, or while he was resting on the building's ledges. The Twitter account for a St. Paul law firm dubbed Paige Donnelly tweeted out several pictures and stated they were informed the building has put live traps on the roof, and that they were hoping he'd make it there in one piece. Local news station KARE 11 even started live streaming the raccoon's movements, and MPR News also streamed live video from the 23rd floor, where the clearly-exhausted raccoon was seen lying on the ledge, as many wondered whether or not it would actually make it to the top. The live stream video showed that, at 2:50 AM local time, the MPR Raccoon did in fact make it to the top. On Wednesday morning, the UBS Plaza Twitter sent out photos of the raccoon in its cage, stating that it enjoyed a meal of "soft cat food," adding that the raccoon would be picked up by Wildlife Management. MPR reporter Tim Nelson shared a number of videos of the MPR Raccoon as it was being taken to be freed, and there is also video of the raccoon being freed, along with a humorous video that shows footage of MPR Raccoon's ascent, along with the Mission: Impossible theme. Dwayne Johnson wasn't the only celebrity enthralled with the MPR Raccoon. Guardians of the Galaxy director James Gunn mentioned the raccoon a few times on Twitter, even going so far as to donate $1,000 to "the non-political charity of choice" of anyone who helps rescue the raccoon. The director also sent out another tweet asking for someone to help the raccoon, while posting images of Rocket Raccoon from Guardians of the Galaxy. 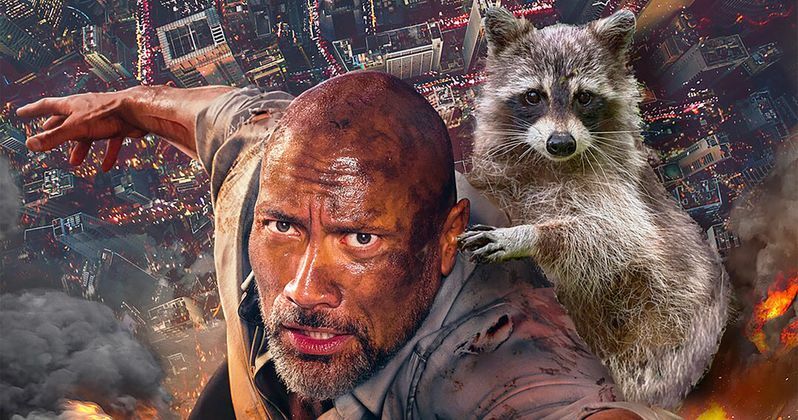 Below we have assembled not only the Skyscraper poster from Dwayne Johnson Instagram, but a number of other tweets and videos following the MPR Raccoon's viral ascent up a 23-story building in St. Paul, Minnesota, and its release back into the wild. We're standing by to hear from animal control officials in St. Paul to see if the #mprracoon found the cat food and live trap waiting for it atop the 23-story office tower the animal finally climbed atop just before 3A CDT. For those of you worried about #mprraccoon: Animal control folks have put live trap on tower roof with aromatic food, hope raccoon smells it and can make its way to the roof, be captured and safely brought down to the ground. Not much else to do but wait and hope. Can Ant-Man 2 Topple The Rock's Skyscraper at the Box Office?